Ever since I started adding fresh corn to my polenta, this has become my easy to fix yummy meal. The husband is loving this version of polenta so much that he never ever thinks twice before nodding when I ask if he would like what I am eating. Many other times I make different meals for the two of us. Simple but different. I cook elaborate 4-6 course meals very occasionally. If you like simple meals for yourself, made the gourmet way this will be the one you would love. I had bought a packet of Chinese black fungus (black mushrooms) from road side stalls of Mc Leodgunj some time back and decided to use it with button mushrooms to enhance flavor. The dried black mushrooms need to be soaked in hot water, they swell up within 10 minutes to become 4 times their original volume. Cut it in strips or small bits and use as you wish. Heat the butter in a pan and tip in the carrots batons. Fry with salt and pepper for 2 minutes and take out of the pan, draining the remaining butter..
Quickly add the chopped garlic to the remaining butter in the pan. 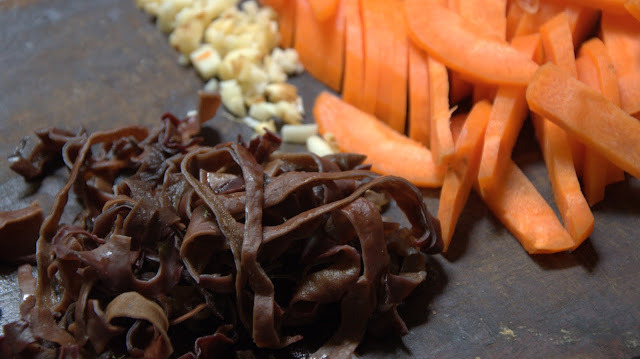 Fry for a few seconds and then add the chopped Black fungus too. Add a little salt and keep stirring for about 30 seconds before adding the shallots and Button mushrooms. Toss and stir fry everything together till the Mushrooms get cooked and Shallots glazed and soft. Sprinkle the dry herbs and cooked Carrots and toss well. I prefer scrambling the eggs in the same pan without adding any more butter. This one is with lots of cracked pepper and dry herbs. Serve over cooked Polenta. This is the same cheesy Polenta I posted some time ago. Scarmbled eggs or boiled eggs on the side is to add protein to the quick meal. And taste too. This is a satiating meal both of us love. Some weekend brunches are like this when we just talk about a whole lot of things while cooking simple food. Yumminess not to be compromised. Butter, garlic and mushrooms can never go wrong together. Add to that a deep earthy flavor of Black mushrooms and it is a new improved version of the same. Spices and herbs can be anything you have at the time or just salt and pepper if garlic is the king. In my kitchen, spices and herbs are chosen right at the time of cooking depending on the season and mood of the day. I was planning to cook this stir fry in a Chinese five spice seasoning but settled for a simpler black peppers and dry herbs instead. The decision to add the Schezuan pepper powder was instantaneous. Just wanted some refreshing heat this time. I might have added some red chilly powder to the stir fry if it was a winters day and the egg scramble would have been included loads of tomatoes may be. Or Broccoli as we love that during winters. How do you decide your spice of the day?